The La Capilla del Hombre is a monumental museum built for the people of Latin America. It is a monument of all the sacrifice, suffering and undying hope of Latin America’s Latin people. It has a massive mural depicting the history of Latin people. A stunning gallery that shows the work of an amazing, sensitive and courageous artist. The museum is composed of Guayas Amin’s gorgeous and fascinating residence, the Capilla del Hombre displaying many pieces of his art, as well as his personal collection of pre-Columbian and colonial art. Entry time: Open from Tuesday to Sunday from 10am to 5pm. Children under 11- entry is free. 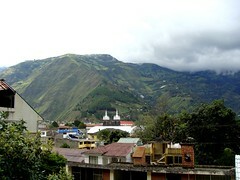 Address: Lorenzo Chavez EA-143 y Mariano Calvache, esq, Quito- Ecuador.